Have you ever noticed how much better someone looks when they smile? Their face looks more youthful and they look more approachable, and more attractive. When you don’t smile, you look grumpy (even if you’re not), older, and less attractive. That’s why taking care of your smile is important. If you’re proud of your smile you will smile more, and smiling can make you look younger. 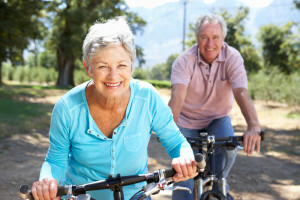 In today’s blog, your Livonia, MI dentist, Dr. James Stewart, suggests ways to maintain your youth with a healthy smile. Research indicates that smiling can make you look younger. The muscles that control your smile work as a natural face-lift. By lifting your face up, a smile makes you appear much younger. A research study conducted in Berlin confirms what other researchers have found. The study consisted of strangers looking at photographs of smiling faces and solemn faces. The strangers were asked to guess the age of the subjects in the photos. The smiling faces were voted younger and more attractive than the solemn faces regardless of the person’s actual age. The good news is that it is not difficult to keep your smile healthy. If you brush after every meal and floss daily it won’t be as easy for food, beverage, tobacco stains, and bacterial plaque to take hold. Keeping your teeth clean is of utmost importance to keeping them healthy. Your diet also helps keep your teeth healthy. By avoiding foods high in sugar, starches, and acids, and choosing foods high in calcium and vitamin C, you can strengthen your teeth and jawbone and keep decay at bay. Sometimes regardless of how good you take care of your teeth you might need a little extra help, especially as your teeth age and stains begin to build up. If that’s the case, over-the-counter whiteners combined with a whitening toothpaste, or professional whitening is always an option. Over-the-counter whiteners are usually used over a matter of days, while professional whitening only takes about an hour.